Cette propriété familiale 5br Beachhouse est assis sur le Inlet, un bloc de l'océan. Asseyez-vous et regarder le coucher de soleil sur l'entrée dans l'un des 9 chaises berçantes sur 3 porches avec l'odeur de steaks de cuisson sur le gril à gaz tandis que les enfants attrapent des poissons et des crabes à partir du quai. Le soir, tout le monde peut profiter de l'Internet et la télévision par câble, ou apporter vos films préférés à jouer sur le lecteur DVD. Il y a deux pompes à chaleur séparées pour haut et en bas. Il ya 2 cuisines complètes, une à l'étage et un vers le bas. Deux tailles réfrigérateurs, fours, grille-pain, micro-ondes, mélangeurs, cafetières complets et un lave-vaisselle. Il ya une douche extérieure et deux tables de pique-nique. Vous êtes juste une courte promenade de la jetée de Garden City, Arcades, épiceries, les restaurants et boutiques de cadeaux. We visited this property with myself, my spouse, our children, two of my sisters, their spouses and children. The house had plenty of room for everyone we didn't feel cramped at all! The upstairs and downstairs are essentially two separate units which was wonderful for us since we had young children who needed naps. The home itself is an older home, but it is very clean and has plenty of kitchen utensils, pots and pans, and 2 coffee pots and 2 kuregs. There are two kitchens, which was also great. When one family had children that woke up a bit earlier than the others, we didn't have to disturb them to get breakfast started. 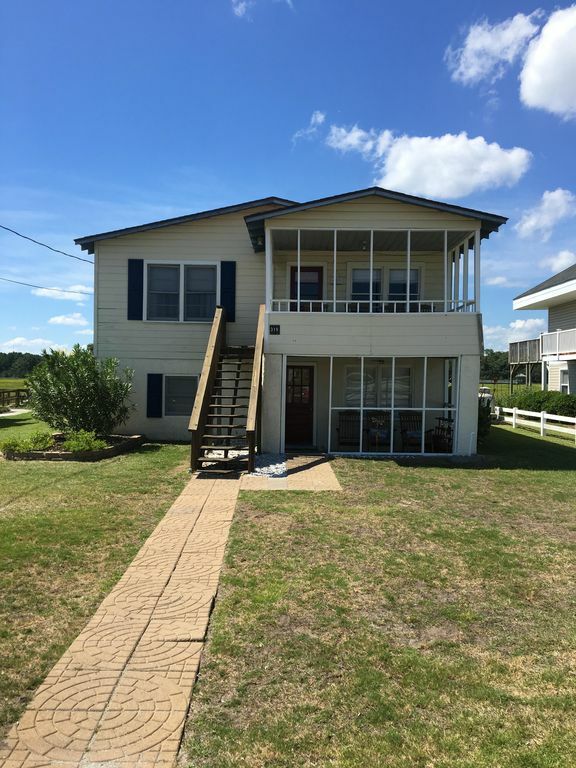 The house is a short walk to the beach, and the public access to the beach is right at the end of the block. The pier had fun activities to keep the kids busy. The best part was the owner who went above and beyond to help us out however he could! Overall, I would highly recommend this property to anyone, especially to larger groups of people. This is the perfect place for a large family gathering or an intimate weekend for two. My wife and I celebrated the holiday week with family and had a wonderful time. We had 10 adults and 3 children with room for a few more. A short walk to the beach or pier and other activities. The private deck on the inlet or newly renovated back porch is perfect to enjoy amazing sunsets. The outside shower was a hit with everyone and great after a day at the beach. It's a very short drive to anything you may need to enjoy your stay. We plan on making it a yearly destination! Garden City Beach est une communauté «familial» avec des boutiques pittoresques, des arcades et des salons de crème glacée. La jetée propose des spectacles en soirée ainsi que la pêche. Si vous avez envie d'encore plus d'excitation, Myrtle Beach est un court 8 miles.